You are here: Home › Worship › Worship Made In Canada? I have mulled this post around for a while. Canada Day (July 1) seems the right time to publish it. I believe that being in church is important for my children and for me. We’ve rarely missed a Sunday since Jane died. It hasn’t been easy though. My hearing has been amplified by mourning. Things that once passed easily through my grid now get caught. I hear so many lyrics that we sing in new ways. That got me wondering about what “we” (the church, that is) sing. As I probed around for data I found the CCLI Top 25 lists. These lists compile “the Top 25 songs reported by churches in their Copy Activity Reports”. The Copy Activity Reports are used for royalty payouts. One interesting feature is that there are separate lists for each geographical region, including one for Canada. 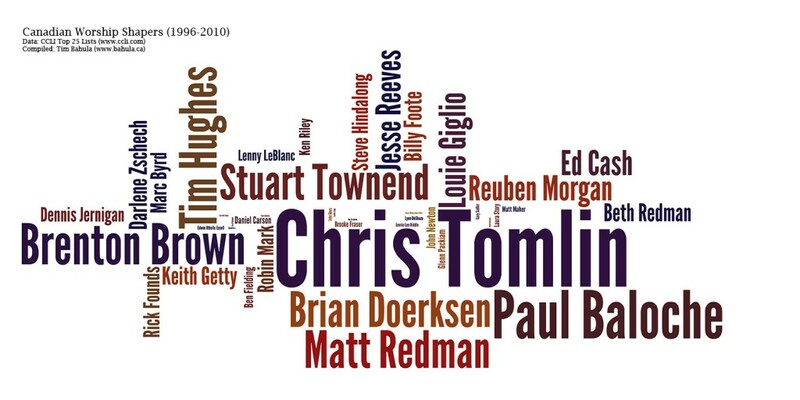 While playing around with the data I realized that I could get a picture of who has shaped Canadian worship. I hadn’t thought of that particular question before. While serving as a missionary in Trinidad, however, I did often wonder why we sang so many American and British hymns and choruses. I actively encouraged the Trinidadian church musicians to spread their wings by writing worship music for the Trinidadian church. Around the same time I discovered the data, I met Chris Vacher, Director of Worship at Orangeville Baptist Church and Founder of WorshipRises. He said, “No worship leader would ever say something like ‘The only songs God will use to change Canada and the Canadian church will be from other countries’ but that’s exactly how the vast majority of us were programming our services.” Now I found that I could explore this issue in the Canadian context with some good data. I grabbed a copy of all the freely available CCLI Top 25 lists. They list the top 25 songs that were sung in reporting Canadian churches from October 1996 until September 2010. I threw them into a big Excel blender to crunch the data. Excel counted the number of times that each name appeared in the 28 reporting periods. Cursive writing will never die! I think this is a great question to be exploring, but in order to answer it we have to be able to ask, “What does it mean to be a Canadian or a Canadian church?” I don’t think that is as a really simple question to answer. One church I visited recently had a music team of seven people. Within those seven people there were five different nationalities from five different continents represented. Other music people out there…what should uniquely Canadian worship look like in this multi-ethnic context? I guess the most surprising thing here for me is that Tomlin only showed up 43 times!